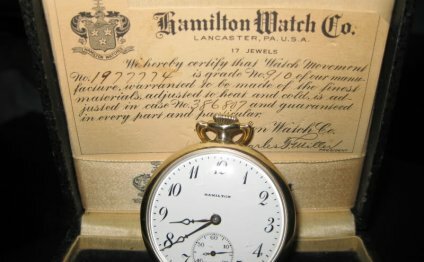 In 1893, the Hamilton Watch Company of Lancaster, Pennsylvania began producing pocket watches primarily for railroad workers. Railroad-grade watches had to meet strict guidelines to ensure their reliability and accuracy. Hamilton met these standards, and more. Its watches had 42-hour mainsprings, with 17 jewels in their isochronous movements. Physically, the watches were large (size 16 or 18), and they had easy-to-read boldface Arabic numerals on their faces. Little wonder, then, that a lot of Hamilton watches found their way into the pockets of a lot of railroad employees. As a result of its focus on the railroad industry, Hamilton never had the widespread brand recognition of giant watchmakers like Elgin and Waltham. But Hamilton was content with its reputation for accuracy. In fact, its pocket watches were so highly regarded that by the beginning of the 20th century, the company’s 1893 Broadway Limited model was named the official timepiece of all U.S. Expeditionary Forces. In World War I, a wristwatch version of the Broadway Limited was made for troops and General Pershing himself. The Broadway Limited, along with another railroad-grade watch called the Model 992, accounted for the bulk of the company’s sales during this period. Both models were decorated with the standard Arabic numerals, often with gold lettering and center wheels on their faces. Some 992s had Montgomery dials, in which not only the hours were labeled but the minutes as well. Other companies tried to copy this design, but Hamilton’s Montgomery dials were unique for the way in which all numbers could be read on the dial—the 6 at the bottom of the watch was actually placed inside the seconds dial so that the numeral 30 would still be readable. Today, these pre-1920 workhorses are among the most collectible Hamiltons around. Before and after World War I, Hamilton was simply unable to compete with the production rates and sales of bigger watch companies like Waltham. So, in addition to focusing on railroad-grade pocket watches, it also made pocket watches for well-heeled customers. For these watches, Hamilton incorporated expensive materials into its mechanisms. It’s not uncommon to find antique Hamilton pocket watches from the first quarter of the 20th century with gold screws, wheel sets, and cases. In 1927, Hamilton acquired Illinois Watch Company, which helped increase its overall production levels. During the Great Depression, it remained a maker of prestige watches. Then, in World War II, Hamilton, like many other watchmakers, shifted gears to make instruments for the war effort. Here Hamilton’s railroad roots served it well—its Navy chronometers were considered some of the most accurate mechanical timepieces ever made. Hamilton produced far more wristwatches than pocket watches after World War II, but it continued to supply the high-end pocket-watch market. Following the trend of many other watchmakers in the 1950s, Hamilton began using movements imported from Switzerland. Its remaining railroad watch, the pricy 992B, wasn’t phased out until 1969.